Carpal tunnel syndrome is a painful nerve problem that interferes with the use of your hand. Symptoms range from wrist pain, numbness, tingling, burning, weakness or loss of grip strength, and loss of sleep due to discomfort. Carpal tunnel has become one of the most widespread occupational health problems we face today. It affects millions of people a year, and with our growing reliance on computers, ipads or smartphones, there seems to be no end in sight. Causes of Carpal Tunnel Syndrome? · Overuse Injuries – from common activities like typing, chopping, hammering, or pushing. · Wear & Tear – repetitive hand movements (RSI), such as working on an assembly line, at a computer, or with power tools, can cause the tendons to become inflamed and press the nerve against the carpal tunnel. · A Misaligned Joint – an injury to the wrist or arthritis in the wrist joint can cause a bone to protrude in to the carpal tunnel. 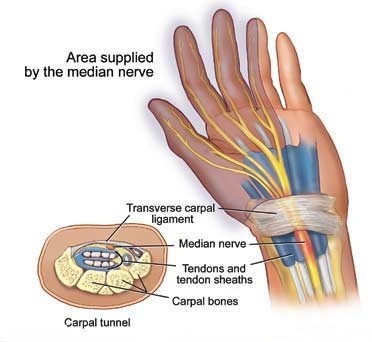 The tunnel becomes narrower, putting pressure on the median nerve. An injury to the neck can also cause the median nerve to swell and press against the tunnel. · Fluid Retention – can cause the tissue in the carpal tunnel to swell and presses on the median nerve. This can be caused during pregnancy or due to some common medications. These type of care, along with other procedures, can in most cases effectively alleviate and eventually eliminate the symptoms associated with carpal tunnel. Surgery in some cases, should be the last option. To keep pressure off the nerve in your wrist, keep your wrist in a neutral (straight) position. Avoid twisting, bending, pinching, or pressing motions. Rest your hand often. Avoid making repetitive movements or holding objects in one position for long periods. Contact us today and get rid of your pain.